BACKGROUND: This study attempts to highlight the vasodilatation effects of L-carnitine on the left internal mammary artery (LIMA) in patients undergoing coronary artery bypass graft (CABG) surgery. PATIENTS AND METHODS: A total of 45 male patients (age 55–60 years), and body weight (70–75 kg) were included in this study. Participants were planned to undertake elective CABG surgery, and they were randomly allocated into two study groups as follows: Control group included 15 patients received placebo capsule (lactose capsules), twice daily for 3 successive days before CABG surgery. L-carnitine-treated group included the remaining 30 participants received L-carnitine capsules, 500 mg twice daily for 3 days before CABG surgery. RESULTS: The two groups were comparable according to their age and comorbidities. There was significant increase in the plasma levels of endothelial nitric oxide synthase (eNOS) and matrix Gla-protein (MGP) among the L-carnitine group as compared with the control group (P < 0.001, P = 0.011, respectively). At the same time, tissue eNOS levels and tissue MGP levels were significantly higher (P = 0.078, P < 0.001, respectively) in the L-carnitine group as compared with the control group. Plasma levels of angiotensin II (ANGII) and endothelin-1 (ET-1) levels were significantly lower (P < 0.001) in the L-carnitine group. Tissue levels of ANGII and ET-1 were significantly lower (P = 0.039, P < 0.001, respectively). CONCLUSIONS: We can conclude that L-carnitine has potent vasodilatation effects on LIMA during CABG surgery as evidenced by the increase in plasma and tissue levels of eNOS and MGP, associated with a decrease in plasma and tissue levels of ANGII and ET-1. Maintaining a vascular tone is one of the vascular endothelium functions. Vasoconstrictor and vasodilator substances derived from endothelium and play a role in maintaining a balance between vasoconstriction and vasodilatation and this is known as a vascular tone. Endothelium-derived contracting factors produced from the endothelial cell and played a role in mediating smooth muscle contraction by increasing intracellular calcium concentration. Endothelium-dependent relaxation has a major function in vascular relaxation. These are endothelium-derived nitric oxide (NO),, prostacyclin, and endothelium-derived hyperpolarizing factor. L-carnitine is a vitamin-like nutrient synthesized from N-trimethyllysine in the liver and the kidneys; lysine and methionine are the substrates for carnitine synthesis. L-carnitine may increase NO involve in endothelium-dependent relaxation and may reduce reactive oxygen species. This study aims to evaluate the vasodilation effects of L-carnitine on the LIMA in patients undergoing CABG surgery. A total of 45 male patients (aged 55–60 years) and body weight (70–75 kg) were included in this study between October 2014 and December 2015. Participants were recruited from Al-Sadr Hospital Cardiothoracic Center, Al-Najaf, Iraq. All participants in this study were planned to undertake elective CABG surgery. This study was approved by the Human Ethics Committee, College of Medicine, University of Kufa, Iraq. All participants were received information sheets, and they signed informed consent for their participation in this study. Group 2: (30 patients) (L-carnitine-treated group): Patients received L-carnitine 500 mg capsule (BioActive T, U.K) twice a day for 3 successive days before CABG surgery. On the CABG day, papaverine was injected at room temperature through the endothoracic fascia parallel to the mammary artery and intraluminal with blunt needle. The two study groups were comparable according to the age and comorbidities. The LIMA was surgically removed. On one end of the artery which was prepared for bypass grafting, papaverine (10 mg) (1 mg/ml 0.9 saline) was injected at room temperature through the endothoracic fascia parallel to the mammary artery and intraluminal with blunt needle. Off-pump CABG is used for all patients. Two and a half milliliters of arterial blood samples were collected immediately preoperative and 4 h postoperative using a disposable syringe. Samples were placed in anticoagulant test tubes (disodium ethylenediaminetetraacetic acid, 22 mg/ml) and mixed thoroughly. Samples were mixed completely and then centrifuged at 300 rpm for 15 min; supernatants were used for determination of plasma endothelin-1 (ET-1), angiotensin II (ANG II), endothelial NO synthase (eNSO), as well as matrix Gla-protein (MGP). All biomarkers measured in this study (ET-1; ANG II; eNOS; and MGP) were measured using enzyme-linked immunosorbent assay kits (Elabscience Biotechnology, USA), in both plasma and tissues. Statistical analyses were done using SPSS statistical package for the social sciences version 20 (IBM in 2009, Chicago, USA). Chi-squared test was performed to test for categorical data and paired t-test and independent sample t-test for numerical data and Pearson correlation coefficient. P ≤ 0.05 was considered as statistically significant. 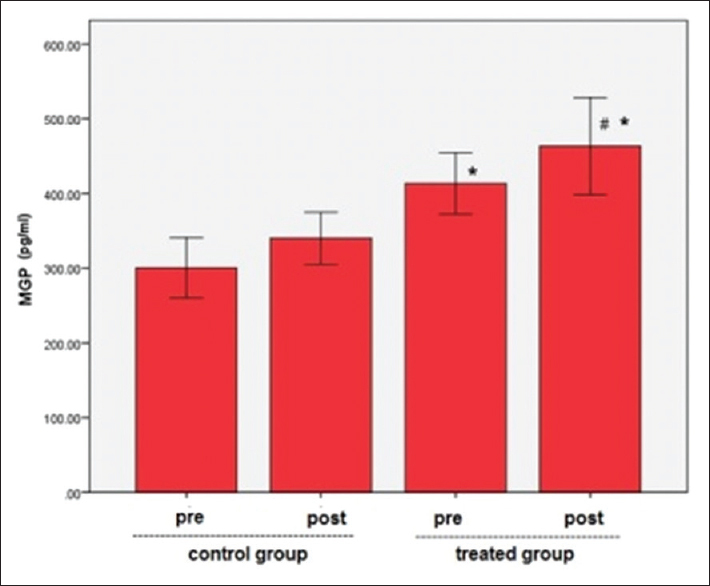 Effect of L-carnitine on human MGP tissue level – Tissue MGP levels were significantly higher in the L-carnitine-treated group (378.78 ± 139.16) than placebo-control group (248.45 ± 78.91), P < 0.001. To the best of our knowledge, this is the first study of its type to examine the effects of L-carnitine on the selected biomarkers of this study. There are many reasons behind graft failure in patients after having CABG surgery. These mainly include spasm during harvesting and mobilization injury, postpericardiotomy syndrome, and inflammation. The endothelium of the blood vessels responds to hemodynamic forces and blood-borne signals by releasing of various paracrine and autocrine substances. The releasing of these bioactive factors control vascular homeostasis; therefore, endothelial cells dysfunction will disrupt this balance and may cause vasoconstriction, leukocyte adherence, platelet activation, mitogenesis, pro-oxidation, thrombosis, coagulation impairment, as well as vascular inflammation and atherosclerosis. Furthermore, intracoronary papaverine causes a significant increase in coronary arterial diameter. This has clinical implications for assessing coronary flow reserve with devices that detect flow velocity. Our study found a significant rise in the levels of eNOS in the L-carnitine-treated group as compared with the placebo-control group. NO synthase is responsible for the NO synthesis from L-arginine. Increase in eNSO levels improves endothelial function and decreases the formation of unwanted oxidants such as superoxide and hydrogen peroxide., NO plays a major role in maintaining vascular tone and reactivity which act as a key for endothelium-derived relaxing factor. The action of potent endothelium-derived contracting factors such as ANG II and ET-1 was negated by action of NO (20). Previous studies described the vasodilatation action of the L-carnitine through restoring endothelial dysfunction, reducing reactive oxygen species, and increasing NO participation in endothelium-dependent relaxation. ET-1, on the other side, acts as a potent endothelium-derived contracting factor; hence, it counteracts NO action (a potent endothelium-derived relaxing factor), both of them had significant role in maintaining vascular tone. During cardiac surgery such as in CABG operation, ET-1 has a strong association with coronary and/or graft vasospasm. Our study proved that L-carnitine could significantly reduce ET-1 levels, inhibiting a potent endothelium-derived contracting factor. We can conclude that L-carnitine plays a central role in producing vasodilatation of the LIMA during CABG surgery as it evidenced by the increase in plasma and tissue levels of the eNOS and MGP, associated with decrease plasma and tissue levels of ANGII and ET-1. Yuan SM, Li Y, Ben YH, Cheng XF, Li DZ, Li DM, et al. Graft pathology at the time of harvest: Impact on long-term survival. Rev Bras Cir Cardiovasc 2014;29:543-51. Villareal RP, Mathur VS. The string phenomenon: An important cause of internal mammary artery graft failure. Tex Heart Inst J 2000;27:346-9. Sawaya FJ, Liberman H, Devireddy C. Physiologic functional evaluation of left internal mammary artery graft to left anterior descending coronary artery steal due to unligated first thoracic branch in a case of refractory angina. Case Rep Cardiol 2016;2016:3175798. Muir AD, McKeown PP, Bayraktutan U. Role of gender, smoking profile, hypertension, and diabetes on saphenous vein and internal mammary artery endothelial relaxation in patients with coronary artery bypass grafting. Oxid Med Cell Longev 2010;3:199-205. Sogo N, Campanella C, Webb DJ, Megson IL. S-nitrosothiols cause prolonged, nitric oxide-mediated relaxation in human saphenous vein and internal mammary artery: Therapeutic potential in bypass surgery. Br J Pharmacol 2000;131:1236-44. Casula R, Khoshbin E, Athanasiou T. The midterm outcome and MACE of robotically enhanced grafting of left anterior descending artery with left internal mammary artery. J Cardiothorac Surg 2014;9:19. Loop FD. Coronary artery surgery: The end of the beginning. Eur J Cardiothorac Surg 1998;14:554-71. He GW. Arterial grafts: Clinical classification and pharmacological management. Ann Cardiothorac Surg 2013;2:507-18. Raffetto JD, Yu P, Reslan OM, Xia Y, Khalil RA. Endothelium-dependent nitric oxide and hyperpolarization-mediated venous relaxation pathways in rat inferior vena cava. J Vasc Surg 2012;55:1716-25. Treuer AV, Gonzalez DR. Nitric oxide synthases, S-nitrosylation and cardiovascular health: From molecular mechanisms to therapeutic opportunities (review). Mol Med Rep 2015;11:1555-65. Radomski MW, Palmer RM, Moncada S. The anti-aggregating properties of vascular endothelium: Interactions between prostacyclin and nitric oxide. Br J Pharmacol 1987;92:639-46. Ozkor MA, Quyyumi AA. Endothelium-derived hyperpolarizing factor and vascular function. Cardiol Res Pract 2011;2011:156146. Stead R, Musa MG, Bryant CL, Lanham SA, Johnston DA, Reynolds R, et al. Developmental conditioning of endothelium-derived hyperpolarizing factor-mediated vasorelaxation. J Hypertens 2016;34:452-63. Emami Naini A, Moradi M, Mortazavi M, Amini Harandi A, Hadizadeh M, Shirani F, et al. Effects of oral L-carnitine supplementation on lipid profile, anemia, and quality of life in chronic renal disease patients under hemodialysis: A randomized, double-blinded, placebo-controlled trial. J Nutr Metab 2012;2012:510483. Carlson EB, Gilliam FR 3rd, Bashore TM. Changes in epicardial coronary arterial diameter following intracoronary papaverine in man. Cathet Cardiovasc Diagn 1988;14:150-3. Qin M, Zeng Z, Zheng J, Shah PK, Schwartz SM, Adams LD, et al. Suppression subtractive hybridization identifies distinctive expression markers for coronary and internal mammary arteries. Arterioscler Thromb Vasc Biol 2003;23:425-33. Verma S, Anderson TJ. Fundamentals of endothelial function for the clinical cardiologist. Circulation 2002;105:546-9. Ali MI, Chen X, Didion SP. Heterozygous eNOS deficiency is associated with oxidative stress and endothelial dysfunction in diet-induced obesity. Physiol Rep 2015;3. pii: e12630. Verma S, Maitland A, Weisel RD, Fedak PW, Pomroy NC, Li SH, et al. Novel cardioprotective effects of tetrahydrobiopterin after anoxia and reoxygenation: Identifying cellular targets for pharmacologic manipulation. J Thorac Cardiovasc Surg 2002;123:1074-83. Karimi Galougahi K, Liu CC, Garcia A, Gentile C, Fry NA, Hamilton EJ, et al. B3 adrenergic stimulation restores nitric oxide/Redox balance and enhances endothelial function in hyperglycemia. J Am Heart Assoc 2016;5. pii: e002824. Alvarez de Sotomayor M, Bueno R, Pérez-Guerrero C, Herrera MD. Effect of L-carnitine and propionyl-L-carnitine on endothelial function of small mesenteric arteries from SHR. J Vasc Res 2007;44:354-64. Desideri G, Grassi D, Croce G, Bocale R, Tiberti S, Evangelista S, et al. Different effects of angiotensin converting enzyme inhibitors on endothelin-1 and nitric oxide balance in human vascular endothelial cells: Evidence of an oxidant-sensitive pathway. Mediators Inflamm 2008;2008:305087. Matheis G, Haak T, Beyersdorf F, Baretti R, Polywka C, Winkelmann BR, et al. Circulating endothelin in patients undergoing coronary artery bypass grafting. Eur J Cardiothorac Surg 1995;9:269-74. Brozovich FV, Nicholson CJ, Degen CV, Gao YZ, Aggarwal M, Morgan KG, et al. Mechanisms of vascular smooth muscle contraction and the basis for pharmacologic treatment of smooth muscle disorders. Pharmacol Rev 2016;68:476-532. Hitomi H, Mehta PK, Taniyama Y, Lassègue B, Seidel-Rogol B, San Martin A, et al. Vascular smooth muscle insulin resistance, but not hypertrophic signaling, is independent of angiotensin II-induced IRS-1 phosphorylation by JNK. Am J Physiol Cell Physiol 2011;301:C1415-22. Cranenburg EC, Vermeer C, Koos R, Boumans ML, Hackeng TM, Bouwman FG, et al. The circulating inactive form of matrix gla protein (ucMGP) as a biomarker for cardiovascular calcification. J Vasc Res 2008;45:427-36. Yousif NG, Sadiq AM, Yousif MG, Al-Mudhafar RH, Al-Baghdadi JJ, Hadi N, et al. Notch1 ligand signaling pathway activated in cervical cancer: Poor prognosis with high-level JAG1/Notch1. Arch Gynecol Obstet 2015;292:899-904. Jia G, Stormont RM, Gangahar DM, Agrawal DK. Role of matrix gla protein in angiotensin II-induced exacerbation of vascular calcification. Am J Physiol Heart Circ Physiol 2012;303:H523-32. Kim LK, Yoon JW, Lee DH, Kim KM, Choi SH, Park KS, et al. Impact of metabolic syndrome on the progression of coronary calcium and of coronary artery disease assessed by repeated cardiac computed tomography scans. Cardiovasc Diabetol 2016;15:92. Almasi A, Pouraliakbar H, Sedghian A, Karimi MA, Firouzi A, Tehrai M, et al. The value of coronary artery calcium score assessed by dual-source computed tomography coronary angiography for predicting presence and severity of coronary artery disease. Pol J Radiol 2014;79:169-74. Camici PG, Crea F. Coronary microvascular dysfunction. N Engl J Med 2007;356:830-40.